Good morning all! I have just spent the night listening to the most ferocious gale! I dream't that my windows blew in, but thankfully they didn't. It was a night of very loud wind and rain. I felt for my hardy cabin folks, who must surely have been waiting for the cabins to lift off in true Wizard of Oz fashion! And it must have sounded so loud under those cabin roofs! Up on a hill in Gloucestershire means we have no danger of flooding, but instead have been whipped by the rain and the north westerlies coming up the valley. The news has shown waves coming up the high street in Cornwall and I feel so sorry for the people who's houses have been flooded out, and the farmers trying to cope with their cattle on the somerset levels. Such challenges. I hope you are warm safe and dry wherever you are. I am a little late with my hearts post! we have been having a few internet problems here. I think it may be due to a little mouse who might be living near the cable!.....something else to have to solve!...... I am enjoying this burst of colour from these daffodils and also the lovely scent too. 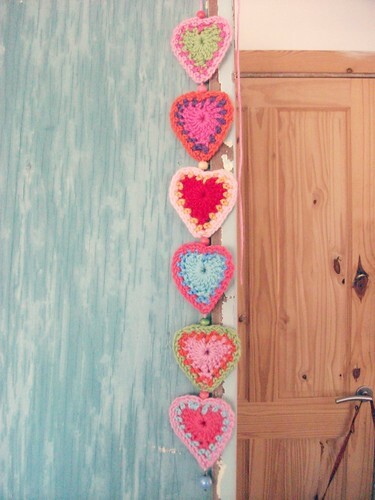 I followed the pattern from Sandra at Cherry heart for the hearts. I think I got it, although each one is a bit different. like Sandra I decided to string them together with some beads and make a dangly decoration. You can see it here against the lovely blue of this cupboard. Which I don't think I've shown you before. This is our games cupboard. It's still full of all the games and puzzles we have played over the years, like a time capsule really. 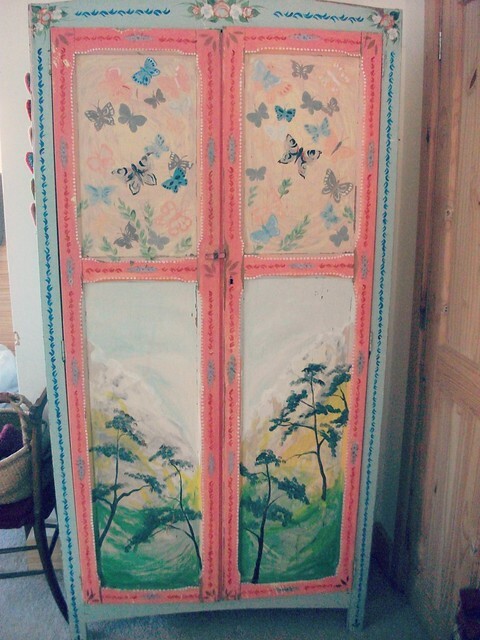 I found this cupboard about 10 years ago in someones garden after it was thrown out. Can you believe it! The story goes that one day they left a visiting artist friend for a few hours with some paint pots and when they came home it had been transformed to this. It had been in their hall for a long time. Well I can tell you that I moved heaven and earth to get this home and save it from the rain. It's really rather magical. Can I give a quick mention to Hesta at Clover Clogg. Are you good at making up names? Hesta is running a competition to guess the name of one of her lovely dolls. The winner will receive one of her whimsical mermaid dolls and it's open until the end of March. Glad to hear you're safe from this awful weather - I'm keeping a very close eye on the trees in our garden and praying they will stay upright! Your hearts are just delightful and that cupboard is so wonderfully whimsical - how could anyone bear to throw it out?! your cupboard is a dream!!!!! 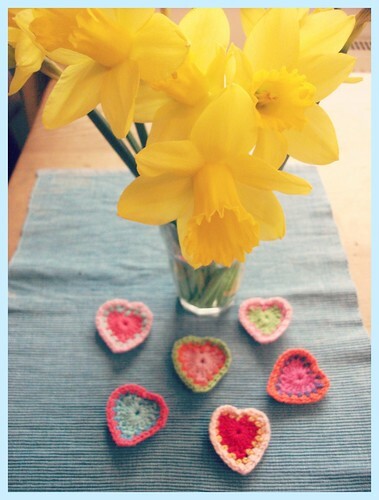 I didn't have time to crochet some little hearts ( too busy with my shawl!!!! ;oD), but yours are just adorable!!! It seems that at the moments there are more floods in England than in Indonesia….. but the Volcano Kelud is doing a big mess…. 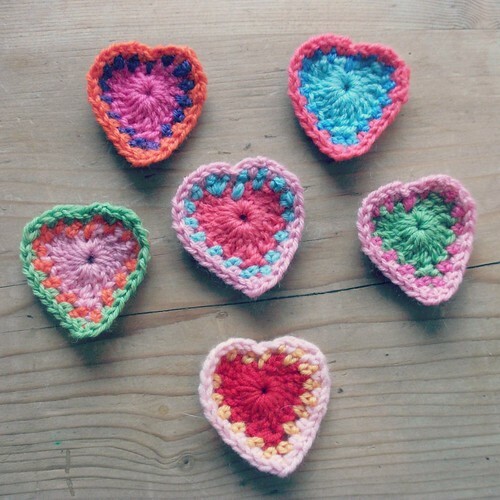 Your hearts look really pretty. The cupboard is magical! I'm so glad you were able to rescue it. We are luckily on high ground, and my family in Dorset and Somerset likewise. Super hearts! I've been thinking of you. So glad you're well and enjoyed the music overnight, too :) I must confess, gale or not, I had a sound sleep! How wonderful that you could give that cupboard a new loving, appreciative home! I imagined it filled with journals, books, colored wool balls in pretty baskets, and crochet hooks in rainbow colors in lovely vintage, floral cups! But well, old games you play with your son are precious, too! The weather has been awful hasn't it! The wind last week was very scarey. I absolutely love the cupboard and so useful too. Oh my good gravy ... that cupboard is incredible ... what a joyous thing to own. Glad to hear you've survived the bad weather ... let's hope there's no more in store! those love hearts are divine!! and im getting so jealous of all the pics I am seeing online of fresh daffodils in the northern hemisphere.. summer is nearly ending here in Melbourne, with autumn and winter to get thru before I see any !!! they are so pretty and cheerful, my favourite. mezz. Hi Heather, So glad to hear you save from the horrible weather!!!! Been watching the telly with a hollow spot in my tummy!!! Those poor people!!!!!! Not only is it flooding but its flooding with horrible freezing temperatures!!! Aweful!!! LOVE love looove your cupboard!!!! Magical it certainly looks!!!! Stay warm and save my friend!!!!! Thinking of you while we suffer from a sweltering heat wave!!!! So glad you rescued this wardrobe from the rain. How beautiful. You have a lovely blog and I look forward to visiting again soon. What a magical cupboard. Love that it's filled with games!